Pamela Z in a Shared Concert with "Open Box"
Pamela Z gives a short performance at the upcoming TEDx coference at Stanford. More details to come. 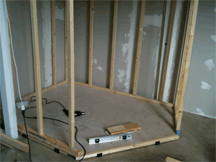 The studio improvement of which I spoke is a brand new isolation booth for recording–built under a loft in my space. As you may know, for many years I’ve lived and worked in an artist building which is essentially a concrete warehouse in San Francisco’s North-East Mission Industrial Zone. As a result, I frequently have to wait till the middle of the night to record, in order to avoid unwanted sounds invading my tracks. So, recently, I did some thorough research on the details of how to best achieve true isolation, and then how to treat the inside of a space to make it acoustically neutral. I sought advice from many of my esteemed sound-engineering-savvy colleagues including Norman Rutherford who maintains a studio across the way at Project Artaud (and to whom I’m particularly grateful for the immense amount of time and and care he put into helping and advising me), as well as the illustrious Gregory Kuhn who’s done sound for every Bay Area contemporary music ensemble and festival you can name, Paul Geluso of Harvestworks in NY, Marco D’Ambrosio of MarCoCo, Terri Winston of Women’s Audio Mission, and Steve Horowitz. They all had varying opinions about some of the details, but I was able to glean a lot of uber-valuable information and basic principles about which they all agreed. I created a small floating room within a room with double walls that don’t touch, built on a pentagonal footprint with no parallel sides. I used double layers of sheetrock inside and out (with loads of a goopy substance called "green glue" sandwiched in between), and fiberglass insulation in the cavity between the two sets of walls. I ran cable for mics and headphones through the walls, plus RCA, USB, VGA, and every other kind of connector I could think of – trying to “future-proof” it before I sealed everything, and I finished it all with inner and outer solid wood doors – each with a half inch thick laminated glass window. 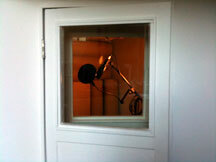 Then, I did a lot of work to acoustically treat the inside of the booth. It was quite a laborious project, but I’m thrilled with the results and looking forward to making my first recordings in it! As soon as I neared completion on the recording booth, I had to clear away all the dust and get myself set up to do some work on my Mereidith Monk piece. Late last year, I arranged and recorded a track for “Monk Mix”, a new double CD of remixes and interpretations of works from throughout Meredith’s long, distinguished career. I chose to do Scared Song, and created a layered studio arrangement of it for the CD. Then, I was asked to come to New York to perform the piece in the CD release concert. So I had to figure out how to perform my version of it live. 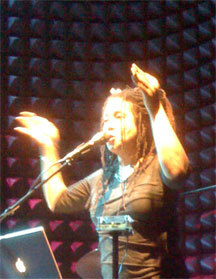 I went off to New York at the end of February and performed in the concert on February 19th at Joe’s Pub along with several other artists on the record including Don Byron, DJ Spooky (who curated & executive produced the record), and Theo Bleckmann. Meredith was on hand to banter with the MC in between performers, and joined us all on stage at the end to dance up a celebratory storm to the mixes of DJ Rehka. It was a fun and musically diverse evening, and the CD itself is even better. I am in very good company with 24 other excellent artists including Björk, Caetano Veloso, Lukas Ligeti, and Vijay Iyer, to name just a few, and I highly recommend purchasing a copy (or download) of it. 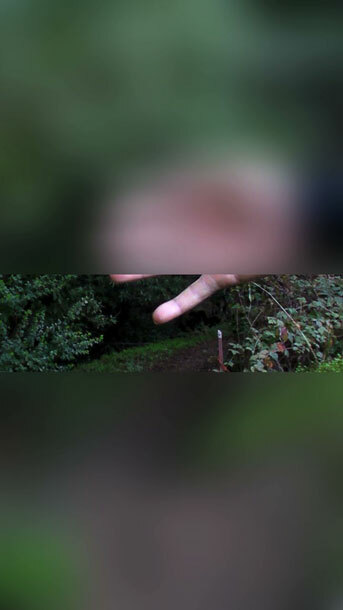 After NY, I came home briefly to give a performance at SF State in connection with an exhibition called smARTspace that is still running in the Fine Arts Gallery. After my solo concert in Knuth Hall, I went over to see the exhibition. I was floored by Jim Campbell’s beautiful, expansive installation with his signature low-res “video” made of floating incandescent bulbs. 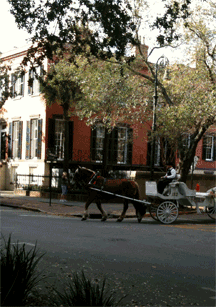 Then, I went to Savannah, GA to perform a solo concert at the Telfair Museum in their Pulse Arts Festival of Art & Technology. There’s a really nice exhibition in their contemporary galleries including an extensive Leo Villareal show. His work with LEDs draws to mind Dan Flavin’s fluorescent pieces and Jim Campbell’s incandescent bulb works. One work called “Field” was like an enormous, softly pulsing canvas. Now that I’m back in San Francisco, I’ve completely fallen into a bottomless abysss of local contemporary music activity in the month of March. Between Other Minds, SF Symphony’s American Mavericks, sfSound’s Cage-tribute concert, the Lou Harrison documentary premiere, and my own performances at Meridian Gallery and my ROOM Series, this month is enough to make any contemporary music enthusiast’s head swim. I, for one, plan to just jump in the deep end and keep immersed throughout the month, only coming up for air in those brief moments between concerts. 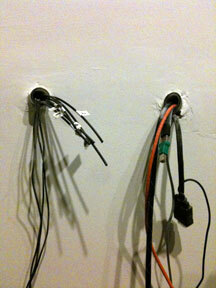 And, of course, for those of us who survive March, there’s the Switchboard New Music Marathon on April 1st! 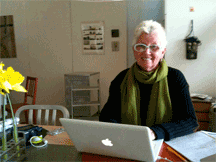 I attended all three of the Other Minds Festival concerts this past weekend, accompanied by my good friend, San Diego new music presenter Bonnie Wright, who will no doubt be blogging extensively about the events in “So Forth”, her online journal. The programming was stellar and really delightful. The very next night, I attended a magical concert with Jaap Blonk and sfSound Group doing improvisations and John Cage works at the Community Music Center. Jaap did a fantastic palindromic version of Kurt Schwitters’ Ursonata in which he performed one movement half-way through and then reversed it – singing it back to the beginning in an effort to “erase” his performance. Priceless! Tuesday, I plan to go Eva Soltes’ Castro Cinema premiere of her Lou Harrison documentary. (Terry Riley will be rising up in the pit playing the Castro pipe organ to intro the film!). 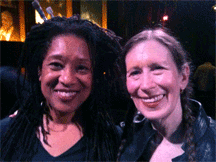 And next week, I’ll be attending most of the SF Symphony’s American Mavericks concerts – including what promises to be a remarkable evening featuring Joan LaBarbara, Meredith Monk, and Jessye Norman, all singing works of John Cage! Amidst all this Bay Area contemporary music activity, I actually have two local performances myself. I’ll be giving a solo concert on March 14th as part of the Meridian Music Series. I’ll be doing works for voice, electronics, and video. Some of my signature pieces will be included, along with new works and works in progress, and I’ll probably include my Meredith Monk “cover tune” somewhere in the evening. I hope to see you there! Then, at the end of the month (on March 30), my ROOM Series has its first event of the season, “Low Reed”. 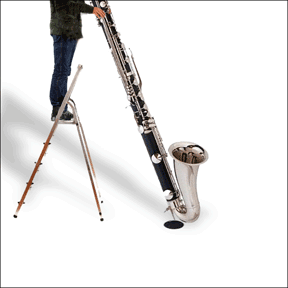 This concert will feature some illustrious musicians of the bass woodwind persuasion (Jon Raskin of ROVA on bari sax, the Bay Area’s bass clarinet duo Sqwonk, and SoCal’s bass clarinetist Marty Walker). All three of these bass reed entities will play alone and in duet with me or each other, and then all of us will come together in an improvised finale for low reeds and voice & electronics. View through the booth's outer & inner doors. 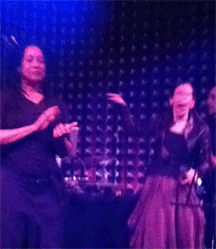 PZ and Meredith Monk at Joe's Pub NYC. 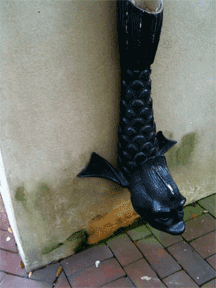 A drainpipe with a fish spout in Savannah. Jim Campbell's tilted plane at SF State Fine Art Gallery. 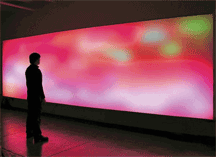 Leo Villareal large "painting" of light. Obey Giant sighting in a Savannah alley. Bonnie Wright blogging in my studio. PZ performing Memory Trace excerpt. The 2012 Room Series opens with a Concert featuring reeds of the bass persuasion. 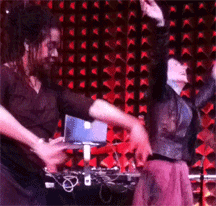 Each will do a solo set and/or duo with Pamela Z, and then Pamela will join all of them in an ensemble finale. 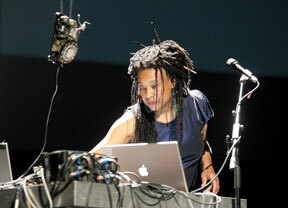 Pamela Z performs a solo set of works for voice and electronics. ensemble delivering a collage of stories and interwoven memory fragments. 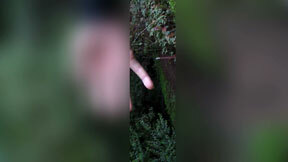 The installation will respond to the presence of a viewer with changes in content, sonic texture, and visual attributes. confuse the two. I am interested in exploring how humans and computers store memory. sounds and aromas trigger very old memories?"